A brand new, very revealing trailer for the Pet Sematary remake is here. Studios are betting big on horror right now and there is no bigger name in horror than Stephen King. That extends to virtually every medium, but given the success that IT enjoyed last year, both critically and at the box office, studios have been snatching up the rights to his novels left and right. Paramount was quick to get their new take on King's 1983 classic going and now we have by far our best, and very revealing, if not spoilery look at the adaptation. As the tagline promises; sometimes dead is better. Warning: this trailer really does give quite a bit away. Those who'd rather go in clean may want to turn back now. The trailer, at first, will seem familiar to those who have read the novel or seen the previous movie adaptation. A family moves to a new town. They discover a strangely ritualistic graveyard for dead pets and then tragedy strikes. Only this time it's the slightly older sister who winds up dead, and not the very young toddler brother. That changes the dynamic and, as we see, leads to some horrific happenings. Body morphing. Lots of creepy kids in masks and a very unfortunate outcome for somebody's Achilles tendon. Directing duo Kevin Kolsch and Dennis Widmeyer were tapped by Paramount to bring Church the cat and the Creed family to the big screen this time around. They wound up on the studio's radar thanks to their indie horror hit Starry Eyes. But this is certainly a more high-profile gig. The script comes from Jeff Buhler who serves as showrunner on SyFy's Nightflyers series, based on George R.R. Martin's novel of the same name. The cast includes Jason Clarke, Amy Seimetz and John Lithgow. The original movie adaptation of Pet Sematary was met with a middling response from critics and did very modest business at the box office, bringing in $57 million total. But that was enough to justify a sequel, 1992's justify Pet Sematary 2. The sequel didn't fare nearly as well in any respect and earned just $17 million at the box office. While it remains to be seen if the studio is hoping to turn this into a franchise, it's a sure bet that they're hoping for a much larger return on their investment. This is far from the only Stephen King movie in active developing. A sequel to The Shining, Doctor Sleep, is gearing up, as well as Firestarter and The Talisman, among others. Not to mention IT: Chapter 2, which arrives this fall. The studio has also released a new poster that has the iconic cat Church looming large in the background. This poster also makes it clear that the girl will be brought back from the dead this time around. 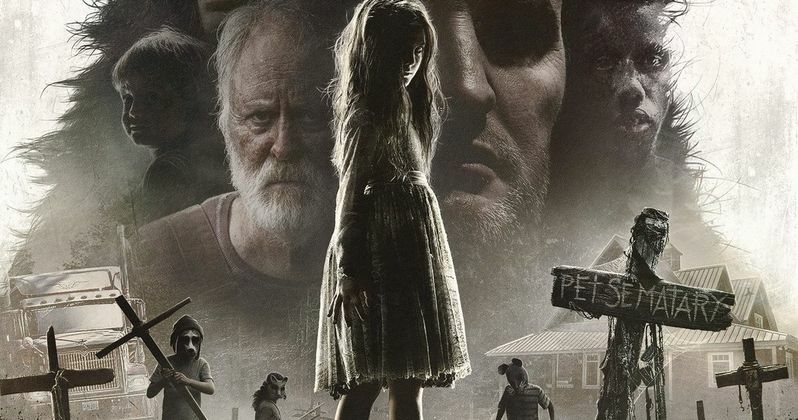 Pet Sematary is set to hit theaters on April 5. Be sure to check out the new trailer from the Paramount Pictures YouTube channel below.